Join Dr. Carl Anderson for a three-part discussion on J.R.R. Tolkien's adaptation of the Old Norse epic of Sigurd and Gudrún. From early childhood, the story of Sigurd the Dragonslayer exercised a fascination on J.R.R. Tolkien. Elements and echoes from the medieval Vǫlsung-Nibelung Cycle of legends are woven through his published fiction. 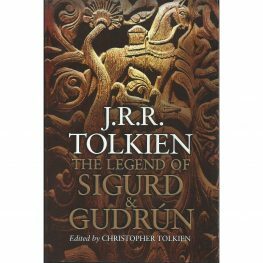 Tolkien composed his own versions of these tales in English alliterative verse modeled on Old Norse poetic style during the 1930s, before the publication of The Hobbit and The Lord of Rings, but these works did not come to light until 2009 when they were published as The Legend of Sigurd and Gudrún. These works, like other posthumously published pieces including “Sellic Spell” (published with Tolkien’s translation of Beowulf), The Fall of Arthur, and The Story of Kullervo, show Tolkien working his own voice through the tangled skeins of myths, legends, and history in anticipation of that voice’s imminent maturation in his own original fiction. Carl Edlund Anderson holds an A.B. in Folklore & Mythology (with a focus on Medieval Scandinavia) from Harvard College and a Ph.D. from the Department of Anglo-Saxon, Norse, & Celtic at the University of Cambridge. He is currently a lecturer for Signum University’s Introduction to Old Norse course, and also teaches in postgraduate university programs for English-language teachers in Colombia, South America. Besides work on medieval and Germanic philology, he has published on topics in bilingual education and indigenous languages of Colombia. The generosity of anonymous donors support this series of special topic seminars. We suggest a donation of $20 per attendee for the entire series. All donations toward our Special Topic Series are applied to the Donor Appreciation Program. Join us on April 27, May 2, and May 4 at 11:30 am EDT. If you are unable to join live, you can watch the recordings on the Signum University YouTube page.